Serving classic New Orleans prohibition and pre-prohibition cocktails, local brews, and New Orleans cuisine. Friday and Saturday April 19 and 20 Robben Ford plays a powerhouse show at Rudy's Jazz Room. Named one of the "100 Greatist Guitarists of the 20th Century" by Musician magazine and recipient of Guitar Player magazine's Lifetime Achievement Legend award, Robben Ford's innovative and soulful musicality triggered a revolution in electric blues guitar styling. A five-time Grammy nominee, bandleader and prolific composer, Robben has collaborated with artists as diverse as Joni Mitchell, Jimmy Witherspoon, Miles Davis, George Harrison, Larry Carlton, L.A. Express with Tom Scott, Phil Lesh, Bonnie Raitt, Charlie Musselwhite, Claus Ogerman, Michael McDonald, Bob Dylan, John Mayall, Greg Allman, John Scofield and many others. Eric Essix began his career as a recording artist, in 1988 with his debut national release First Impressions on the Nova jazz label. Over the next 30 years he would release a total of 24 albums as a solo artist on the Warner Brothers and Capital Records labels along with 15 produced and distributed worldwide by his own Essential Recordings label. Eric has traveled the globe performing for thousands with his own ensembles and has opened concerts for Gladys Knight, B.B. King and Herbie Hancock to name a few. As a sideman, he has supported dozens of major artists including Peabo Bryson for many years, as well a number of jazz greats including Jeff Lorber, Eric Darius, Bob Baldwin, Mindy Abair, Ronnie Laws, Charles Neville and Gerald Albright. $20 includes all you can eat buffet and the best live jazz in Nashville! Every Sunday, 11am-2pm. Join Rudy's for the return of our Friday happy hour soul and jazz series with Charles "Wigg" Walker, Nashville's original soul singer, and his six piece band and horn section. Born in Nashville, Tennessee on July 12, 1940, Charles "Wigg" Walker is one of the few remaining original soul singers from back in the day when old school R&B/soul was brand new on the music scene. Wigg's experience and maturity in the field of soul music gives him authenticity and perspective that is unmatched. In 1960, Charles moved to New York City and in 1962 Charles began recording with Chess Records out of Chicago, Charles soon signed on as lead singer with the J.C. Davis Band and began touring the country opening for the greats of the era including James Brown, Jackie Wilson, Etta James, Wilson Pickett, Little Willie John, Otis Redding, and Sam Cooke. The J.C. Davis Band recorded some real barnstormers for Chess like “Sweet Sweet Love” and “The Chicken Scratch.” In 1964, Charles formed his own group, Little Charles and the Sidewinders. They became one of the most in demand soul bands in New York City’s nightclub scene, performing at the Apollo Theater, Small’s Paradise and venturing out to Las Vegas and Atlantic City. They subsequently recorded for Chess and Decca labels. The Sidewinders stayed together through the 60’s, and in 1969 Charles cut some sides for Botanic Records. The Sidewinders reformed in 1973 and worked as a show band in hotels, nightclubs, and casinos without the benefit of a recording contract. In 1979, Charles signed on with Motown as a staff writer. With a resurgence of old school soul and R&B Wigg is finding his groove with a younger audience while rekindling memories for the old school crowd. 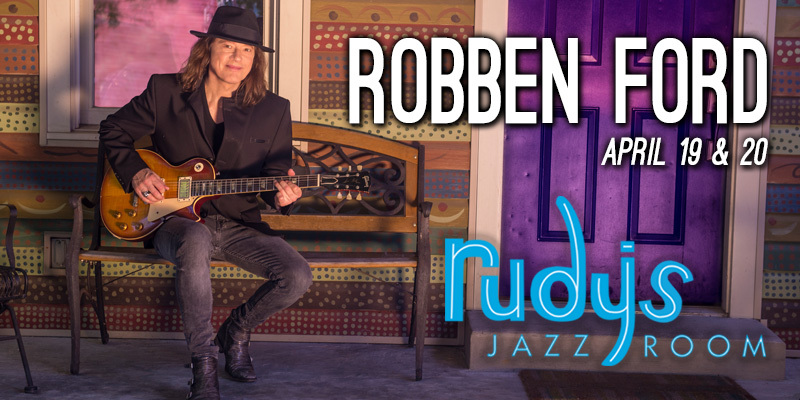 Catch Robben Ford at Rudy's Jazz Room Friday April 19 and Saturday April 20th! *Seating is first come first seated - no reserved seats, 2 drink minimum. Concurrence is a brotherhood of spirit and ideas reflected through music. Co-leaders keyboardist Paul Horton (touring member of Alabama Shakes) and electric bassist Greg Bryant challenge and inspire listeners through their earthy yet probing approach to composition and spontaneous exploration. "Greg and I have ultimate trust in each other," Horton said. Horton has made Nashville, Tennessee home after relocating from his native Athens, Alabama ten years ago. For the last three years, he has toured and recorded with Grammy award- winning band Alabama Shakes. " We have the freedom and space to express our collective consciousness and to execute our compositions as Concurrence in a way that is pure and undiluted. Our music is just as much for us as it is for the audience." "Paul and I have known each other for fifteen years, and I can't think of anyone else I'd rather make music with," Bryant said. Bryant is a native of Nashville, Tennessee and has worked with a diverse assembly of soul and improvisational music pioneers including New Orleans Soul Queen Irma Thomas and Widespread Panic keyboardist JoJo Hermann. "With Concurrence, we allow people to peer into the workings of our brotherhood. It's beyond music and notes. What they're really hearing is Paul and I in fellowship and the honestly of our collective perspective at a given time. 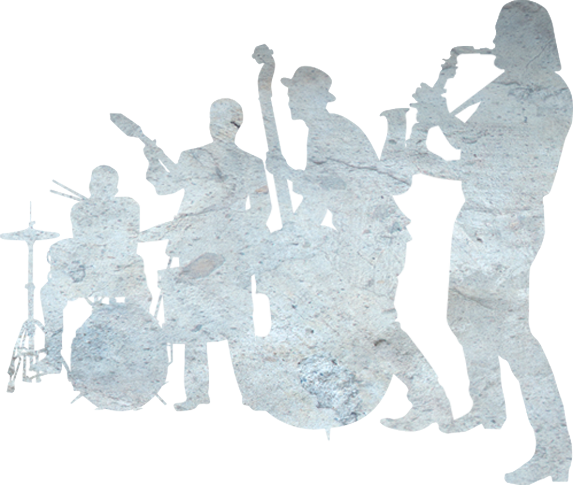 Having completed their first full-length album, "With Brotherhood", released in late 2017, Concurrence has enlisted stellar Montreal / Brooklyn-based drummer and composer Tommy Crane (Greg Osby, Logan Richardson). His high energy pulse and creative rhythmic placement blends with the duo's cerebral and visceral flow to produce a sensitive, joyful and energetic musical dynamic. Catch Robben Ford at Rudy's Jazz Room Friday January 18 and Saturday January 19th! The Cosmic Collective covers multiple styles of music; from Jazz and Bossa nova to Pop, R&B, Funk, and Motown. The group boasts a range of accomplishments, including house dance band at The Grand Hotel in Mackinac Island, MI and a feature on Greg Pogue’s Jazz Station on ACME Radio. 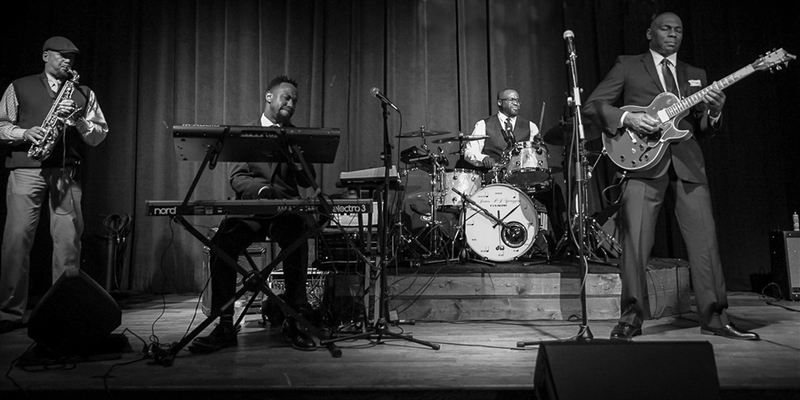 The band consists of formally trained musicians active in the Nashville area, vocalist Nikki Elias, bassist Tyler Enslow, Drummer Jed Smith, Keyboardist Jeff Goodkind, and saxophonist DeVante’ Buford. Their new electric jazz album, Abstract Notions, sports a feature from Jeff Coffin of Béla Fleck & The Flecktones and David Matthews Band, and is currently available on iTunes, Spotify, Amazon, and CD Baby. All you can eat buffet and live jazz with Diane & Frank Marino. Diane and Frank Marino hail from New York City where each received their degrees in music. They’ve have been performing together for over thirty years and since 1989 have achieved great success throughout the greater Nashville, Middle Tennessee areas and the Southeastern United States. Diane is a Jazz recording artist on M&M Records with 6 CD releases that have received national and International acclaim. Enjoy Sunday afternoon flights with Arianna Hume and Ryan Casey. Every Sunday from 2pm-5pm Rudy's offers an array of it's increadible cocktail flights. Originating from Nashville, Tennessee, jazz vocalist Arianna Hume and guitarist Ryan Casey joined together in 2016 to form the Arianna Hume Duo to arrange and perform stylistic covers of popular 1940's and 50's jazz standards. Their expansive repertoire includes the works of Frank Sinatra, Billie Holiday, Ella Fitzgerald, Etta James, George Gershwin, and many more. Additionally, the duo specializes in rearranging contemporary music to fit seamlessly with this music of the past, performing works by artists such as Norah Jones, Van Morrison, Elvis Presley, and Stevie Wonder in such a way to produce a stripped-down, vintage sound. A true legendary jazz drummer, Jackson is the son of Chubby Jackson, and played drums as a young child making appearances with Count Basie, Duke Ellington, Woody Herman, and Buddy Rich before he finished high school. In 1971 he relocated to Los Angeles, where he played with Monty Alexander, Ray Brown, Herb Ellis, Lena Horne, Milt Jackson, and Barney Kessel. Following a tour of Japan with Benny Carter, he appeared on television for two years with Sammy Davis, Jr. (1974-1976). Later in the 1970s he played with Grover Mitchell and did a tour of Europe with the Count Basie Orchestra. In the 1980s Jackson worked with Lionel Hampton, Al Jarreau, James Moody, and Sonny Stitt, and in 1985 re-joined the Basie orchestra while Thad Jones was its leader. Following this he worked with Illinois Jacquet and Artie Shaw, then re-joined the Basie Orchestra under Frank Foster. In the 1990s, he relocated to Fort Lauderdale, where he played with Harry Allen, Billy Ross, and the Manhattan Transfer. Rudy's hosts the official pro jazz jam. Come out and experience some of music city's best as they take the stage with Nashville's next generation of jazz performers! We welcome all ages to this show. After receiving her Masters of Music in Jazz Studies from the University of Northern Colorado, Bethany Merritt returned to Nashville in 2017. Bethany draws inspiration from the classic tones of Blossom Dearie, Betty Carter, and Ella Fitzgerald, as well as creative contemporaries like Gretchen Parlato, Cyrille Aimee, and Esperanza Spalding. Bethany also has a passion for the unique sounds of modern vocal jazz ensembles, both as a member and director. Bethany's song styling is richly nuanced, cheeky yet ethereal, pure but commanding. Woodwind player and composer David Williford was born and raised in Knoxville, TN. Currently residing in Nashville, he works as a performer, composer, and educator. With early musical experiences playing blues, soul, and rock with his father, and studying modern jazz and classical music with artists like Don Aliquo, he has found a diverse and soulful place in the changing music scene. His working band presents original music, free improvisations, and re-imagined standards to Nashville regularly. Apart from his own projects, David has performed and recorded with a wide variety of artists as a player and arranger. Some highlights include Dynamo, Mike Hicks, The Nashville Jazz Composers Collective, Jeff Coffin, Sory DiabatÃ©, Rick Wilkerson, The Great Barrier Reefs, Charles Butler, Michael Toman, and David Rodgers. Born in Nashville, Greg Bryant became aware of music at an early age and gravitated towards the sounds of jazz, Blues, and R&B - being drawn to artists like Herbie Hancock, Weather Report, Miles Davis, BB King, Jimi Hendrix, Stevie Wonder, and James Brown. He studied piano as a child, did hip-hop as a teenager, and began playing bass in college in 1998. Bryant co-led and formed The Human Sound and the Cornerstone Jazz Trio. These musical units encouraged and provided the outlet for his musical discovery. While living in the Washington DC area for a time, participation in jazz club HR-57s jam sessions ignited the desire and passion in him to form his own group. In 2004, Greg Bryant moved back to Nashville and formed his own quintet with area players including Chris West (sax), Reagan Mitchell (sax), Jason Hoffheins (drums) and Brian Mesko (guitar.) Their weekly performances displayed their original compositions and conceptions of standards. In 2008, Greg began devoting his time to a new project ranging from quartet to sextet size called the Greg Bryant Expansion. A cast of Nashville's best and funkiest jazz cats dig deep into the roots of funk, jazz, blues, rock, and soul. You never know who might jump on stage! Don't miss a beat! Gypsy style jazz with Derek Pell, Jerome Degey and Brook Sutton. $3 swamp water shots, 1/2 off draft beer and beignets! Moonshine Rhythm Club breathes new life into old-school swing and jazz with original tunes and arrangements that make this vintage music sound like it was written this morning. The boys seek out timeless melodies and fresh ideas from deep cuts and standards alike and distill them into their signature sound. With each swing of Moonshine, you'll taste notes of Nat "King" Cole's classy and hip vocals and Chet Baker's lyrical phrasing amidst the acoustic fire of Django's gypsy jazz and the slow burn of Count Basie's laid-back groove. Cliff Richmond & the CliffNotes serve up a unique blend of soulful, swinging & funky jazz, They incorporate a wide range of styles from mainstream jazz, to rhythm & blues, Latin to reggae. Founded by Cliff (guitar & vocals) the CliffNotes always features some of Nashville's most accomplished and versatile musicians and vocalists. Stephanie Adlington, otherwise known as, "The Siren Of The South", is a working singer, songwriter, actor, and vocal coach. Born and raised in Grafton, WV, Miss Stephanie is a graduate of the prestigious Royal Academy of Music in London, England, and also attended the Eastman School of Music in Rochester, NY, and (pre-college) Carnegie Melon University in Pittsburgh, PA. While in London, Stephanie recorded with the folk-rock band Renaissance, which produced three critically acclaimed international albums. Known for her unique vocal styling, an evening with Miss Stephanie carries her audience back to the prohibition era - a scandalous rendezvous in a wicked speakeasy, where swagger goes and bourbon flows. Her show titled, "The Jazz, Pearls, and Bourbon Review" is a throwback to the glorious days of old school jazz: think top-shelf juke joint meets Southern hospitality. Drink in an infusion of bourbon, Johnny Mercer, Billie Holiday, Patsy Cline, and Fats Waller and you just sidled up to the bar next to, "The Siren Of The South". The Geoff Pfeifer Quartet, gritty, edgy, the real deal NYC style jazz. Saxophonist Geoff Pfeifer brings some of Nashville's top jazz cats out, and you'll be sure to feel the energy. Playing a mix of original material and Wayne Shorter tunes, Pfeifer leads the group. Geoff Pfeifer, a Nashville based musician and composer, has been living and performing in Nashville since 2005. Geoff studied saxophone with Ted Nash and Ralph Lalama and composition with Mike Holober and Jim McNeely. He is a saxophonist and arranger with the R&B band Chubby and The Dots and plays the 2nd Tenor Saxophone chair in The Establishment Big Band. © 2019 Rudy's Jazz Room, LLC. If you would like to request a table to be held for you for dinner please fill out the form below and we will call or email you to let you know if we can accommodate you. Reservations do not include ticket charges for shows, please check our calendar for show times and ticket prices. We currently do not take same day reservations and upon confirmation we hold seats up to 15 minutes of arrival time. Your request has been submitted. We will email or call you back to let you know if we can make your requested reservation time work.